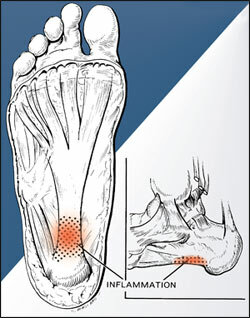 What Can Cause Pain In The Foot's Arch ? There are many causes for a high arch (cavus) foot. In the United States, the most common cause for a high arch foot is a form of muscular dystrophy called hereditary sensorimotor neuropathy. Most people recognize this by the more commonly used name of Charcot Marie Tooth disease (CMT). This is a disease of the muscles and the nerves of the legs, and occasionally of the hands, in which certain muscles weaken while others retain their strength. The condition is transmitted as an autosomal dominant condition. This means that 50% of the offspring will statistically inherit the disorder. This is, however, just a statistic. In some families, all the children develop the condition while in others, none inherit it.